George Wingate Weeks was fourteen years old when he joined the Union army during the Civil War. His scrawled, loopy signature on his enlistment form, and his father's alongside it, declared him to be sixteen. 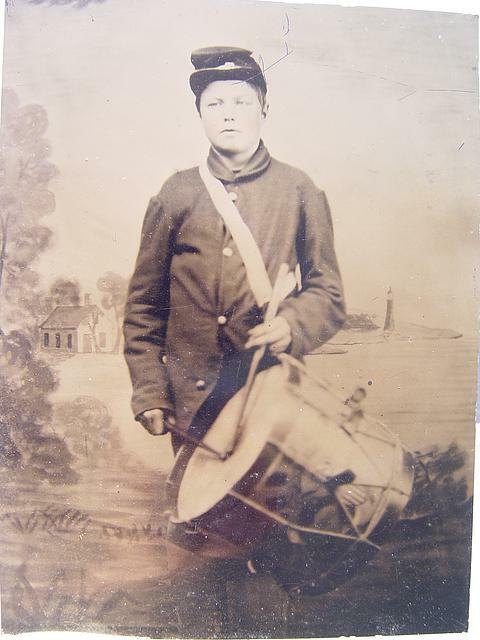 The U.S. Army apparently did not argue, and on October 3rd, 1862, Weeks joined the 8th Maine Infantry as a drummer boy. Weeks, and the other 300 men joining the regiment that fall, soon arrived in Beaufort, S.C. That winter and early spring, the regiment was chiefly employed in guard duty in the area. In May, 1864, it moved to the Bermuda Hundred and joined the Army of the James. Perhaps the increased danger of exchanging guard duty for battle alarmed George's mother, Abigail. She wrote the regiment's Chaplain Nason, who responded on June 3rd. George "appears well, hearty, fleshy and in good spirits', Nason said, 'but is too young to be a soldier." However, Nason did not have much faith in the possibility of cutting through the military bureaucracy and obtaining some special pardon for George before his three-year pledge of service ended. "Having enlisted and entered the service...it will be almost impossible for him to get out of it while he is in health," Nason wrote. He consoled Abigail that George's Captain, Henry Boynton, would not expose him to unnecessary danger, and urged her to write to George 'cheerfully, encouragingly." George surely took his mother's encouragement with him into battle over the course of the next year. But on July, 10th, 1864, during the army's first attempt to capture Petersburg, he was wounded-shot in the foot. His injury was apparently not enough to warrant his discharge, or to prevent him from serving with the 8th Maine for the entirety of the following year. With a fifteen-year-old's exasperation, he reminded his mother of the rules in a letter the following June, 1865. "You seemed to think that I could get a bounty," he wrote. "That is only for disabled soldiers and besides, I don't want a pension. Weeks's immense bravery on the battlefield did not extend to mealtimes. "We get wormy hard tack and beef that God himself would not eat if it was set before him," he complained to his mother in a letter dated September 10th, 1865. Over the next month, Week's last at war, he wrote home every few days, soliciting information and a few dollars for a proper meal, to stave off the chills that had begun to plague the regiment, now stationed at Manchester, Virginia. He promised gifts to everyone waiting in Maine; a pen for his sister Lucy, a tent and revolver for his brother Gus. But no gun, "I would not lug one home with me for the gift of a dozen of them." He mused on his future after the war, and his chances of finding a job in a mill or at sea. And he displayed a wry sense of humor untempered by the war, answering his mother's query as to how someone looked with "he looked out of his eyes, how did you suppose?" Weeks was discharged, having completed his three years of service, on October 13th, 1865. He wrote a pride-filled letter home, this time to both his mother and father, the night before. "As this is my last night in the army I thought I wood (sic) write you a few lines just to let you now (sic) that I was coming home at last," he wrote. "It does not seem as though I had served three years in the Greatest army that was every known." Hoping to arrive home the next Monday, he asked them to tell his brothers to "hold on a bit and I will be there with them." The next sign we see of Weeks is his pension request, granted, $2.66 per month, for his gunshot wound at Petersburg, which now inhibited him from standing and walking. And then his mother's pension request, written August 30th, 1869, and granted for $8 a month, assistance after the death of her twenty-one-year old son. "George Weks." The American Civil War Research Database. "8th Maine Infantry Regiment." The American Civil War Research Database. Compiled by: Ann Tyler Moses, Liljenquist Family Fellow, 2012. Last updated 2012 July.